When I took a TOEIC test at the first time ... it was 790. But I wasn't satisfied with the score so I decided to try again. I studied so much and remembered what I learned at Higher Score® during the test. And I got 915 on the test!!!! Reading section was 420 and listening was 495!! I have a lot of confidence now and really appreciate what you've done for me. Why Study TOEIC With Higher Score®? According to ETS, the organization that develops TOEIC, about 14% of all TOEIC students get 800 points and 4% get 900 points. 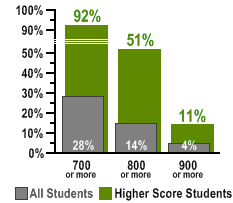 Our record is much better: since 2007, more than 50% of Higher Score® students have scored 800 points and 11% scored 900 points or more. We think we can help you increase your TOEIC score more than other schools. In addition, we are an official TOEIC open test centre. We offer highly-effective, intensive TOEIC courses that are reasonably-priced in Canada's largest cities. Where is the most convenient location for you?